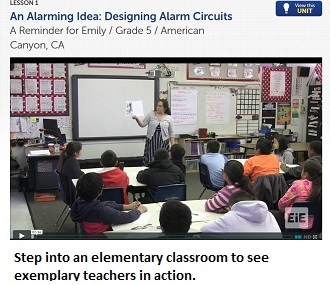 Engineering is Elementary has a large online library of Classroom Videos—nearly 200 in all. These ~10-minute videos are intended to be a resource for elementary teachers who use the EiE curriculum. But they’re also a useful resource for college educators who work with preservice teachers. Tomorrow's elementary teachers will need to make engineering part of the school day—and they can’t how learn to do this just by reading a textbook or sitting in a lecture hall! Your teacher candidates need to observe skilled teachers in their native habitat, to see “what it looks like” when a teacher models science and engineering practices for a roomful of students. But K -5 engineering is still so new that, unfortunately, most student teachers aren’t likely to see this during their observations or practice teaching. That’s where Classroom Videos can help. Each one shows an experienced teacher, facilitating an engineering activity with real students who respond in genuine ways. Each video comes with a set of reflection questions that draw attention both to the instructional strategies and to the moments when students or teachers engage in particular engineering practices. Professor of science education Leanne Avery uses Classroom Videos with her students at SUNY Oneonta. “I break a class of 20 students into four groups of five and give each group the homework assignment of preparing to teach one of the four lessons in an EiE unit,” she says. As part of lesson prep, the students watch the Classroom Video that demonstrates the EiE lesson. Back in class, each of the four groups introduces the lesson to the rest of the class. “This is the You-Tube generation, so they really like video!” Avery says. “And students tell me they find it really helpful to actually SEE what they’re going to be doing in the classroom. 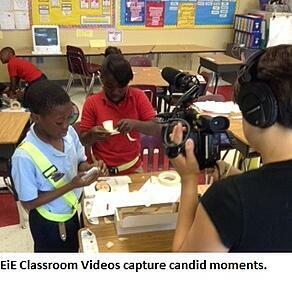 Here’s another way to use EiE Classroom Videos with your preservice students. We know our Classroom Videos are popular—collectively, they’ve been viewed more than half a million times just in the past year. If you’re a preservice teacher, OR a college faculty member working with preservice teachers, we’d love to hear how you’re using these videos in YOUR practice!